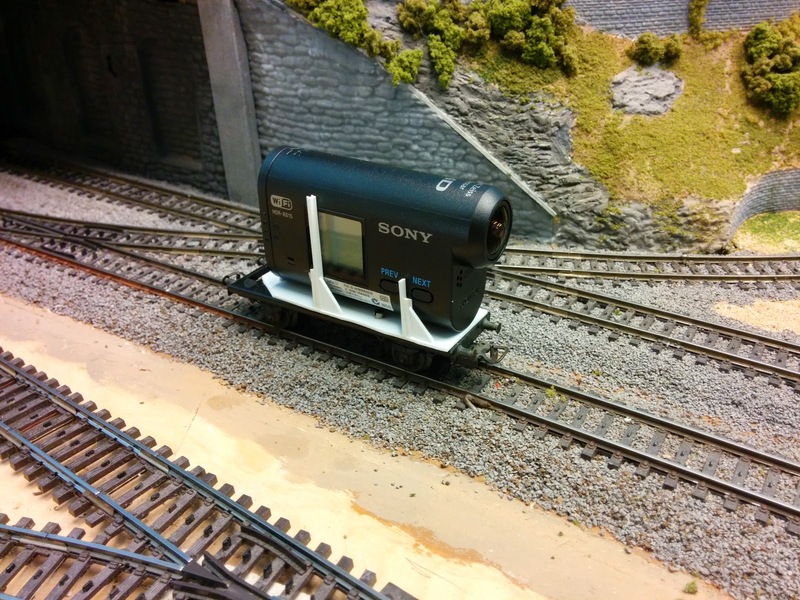 By now I made several longer and shorter videos filming model railroad scenes from a moving train using my Sony HDR-AS15 camera. Here's an overview of the things I've learned while doing that. The AS15 has built-in WiFi providing it's own access point. This makes it very easy to control the camera remotely from an Android phone. The official Sony software for Android with the imaginative name "Sony PlayMemories Mobile" is quite clunky and buggy. However, it's ok for getting the point of view, starting and stopping recording. The software likes to randomly drop the connection between camera and phone. If that happens while recording, the camera just keeps going and upon reconnect the app gets the current state and video stream from the camera. I haven't had a case yet where a connection drop affected the recorded video. The camera records in HD 1080p and produces MP4/H.264 files. While the software supports wireless downloads, and the camera shows up as a storage device when connected to USB, I usually just pop the micro-SD card out of the camera and load the files directly to disk for editing and post-processing. The HDR-AS15 (and it's non-Wifi enabled sister HDR-AS10) has a great form factor for model railroad video in HO or larger. The lens is on the end of the camera not the front like most other action cameras, so its profile naturally lends itself to be put on a flatcar and pass through tunnels just fine. The camera has no orientation sensor, so video recorded with the camera on its head needs to be flipped during video editing. Since the camera looks like a symmetric flattened tube, it needs some support to stay in place and not tip over. I built a cradle from styrene. Originally, I built it so that it would fit perfectly in one of my gondolas, but it turns out that due to the thickness of the molded body the total contraption became too high to pass through the tightest places inside my tunnels. 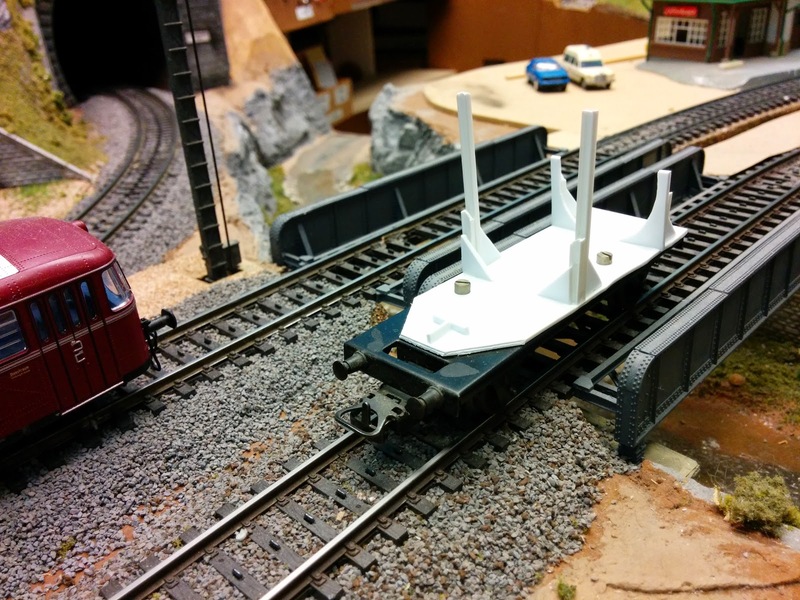 I resolved this by mounting the cradle to the metal underbody of an older kit-built car. Lowering the camera this way just barely cleared the tightest spot inside Hochwaldtunnel. You can hear the pantograph guide inside the tunnel scratching the camera case at 0:44 during the cab-ride across the Welztalbahn. I cover camera orientation and point of view in a follow-up post. Filming action shots of a running train from another train running on a parallel track is an interesting exercise. Turned out quite well, I think. 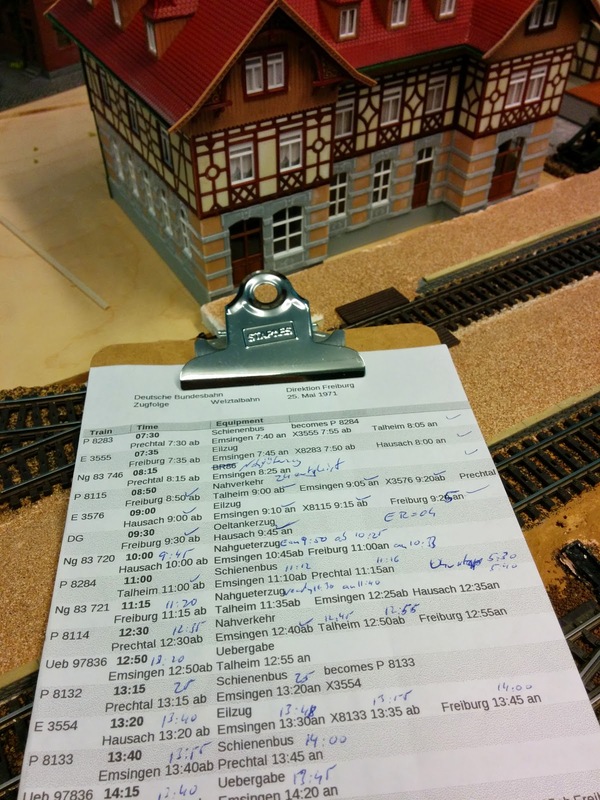 Stefan came over today and we ran the Welztalbahn schedule with a fast clock for the very first time. My sequence schedule always had printed departure times but those were more for decoration rather than supporting operations. 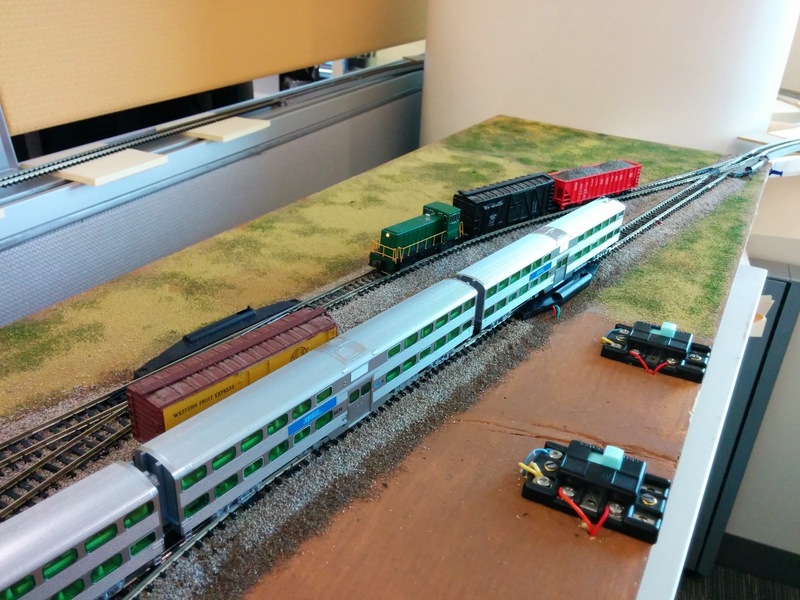 Over the last few sessions I had timed how long the various actions needed to operate the railroad take in reality. I found quite some variation especially for the switching tasks. Nevertheless, it turned out that the scheduled times were quite reasonable when using a 4:1 fast clock. I spaced out the trains so that there is sufficient time for the station operators to finish their switching and servicing chores. We stopped the clock a couple times when time was advancing too fast, or there were mechanical issues. Those weren't nearly as bad as when I operated with Balazs a couple months ago. 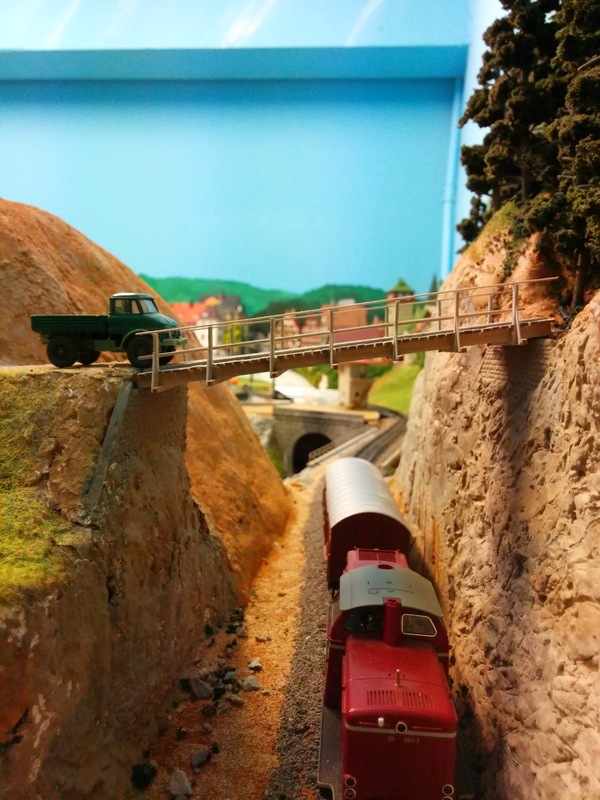 I learned my lesson and cleaned tracks beforehand, especially in the tunnels and staging areas. I will tweak the schedule a little bit to take observed timing issues into account, as well as adjust station dwell times for passenger trains. Overall, I was quite pleased with how this session worked out. With a 4:1 clock this schedule covers 2 hours of real time, vs. about 2.5 hours of elapsed time in sessions with the sequence schedule running the same number of trains. However, when we had a problem, e.g. derailment, today I stopped the clock, and we ran an extra to clean out Talheim some more, so today's session ran for just under 3 hours. In either setup I try to run the session at a reasonably relaxed pace, so that the clock is typically something you wait for, vs. pushing you forward. This is a really busy week. 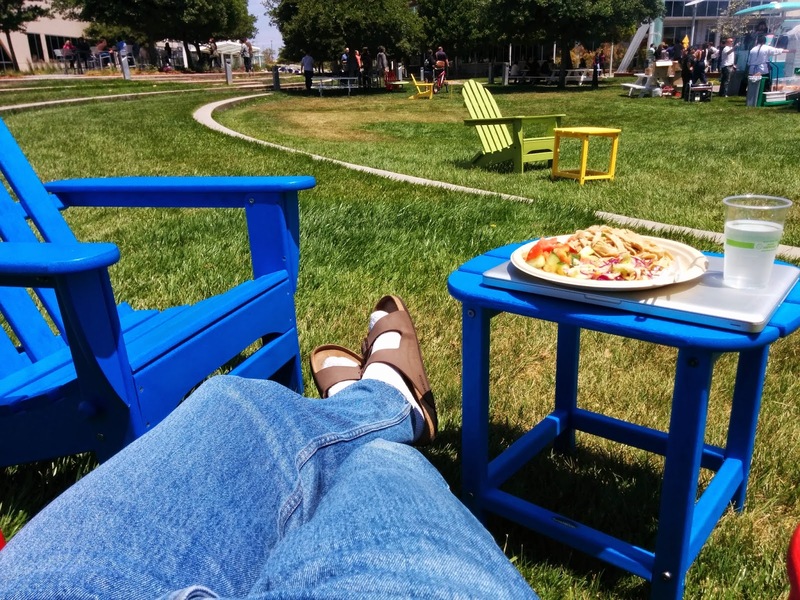 Taking a break at lunch time. 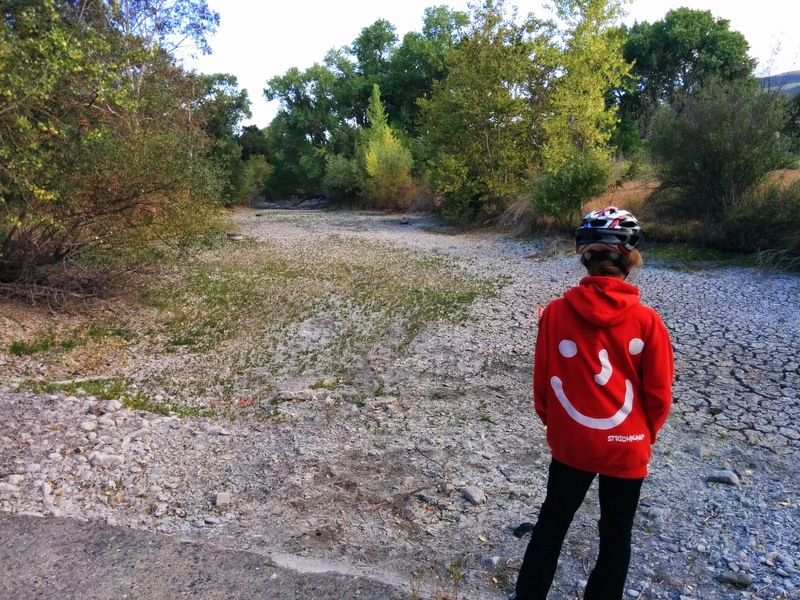 The annual Bike to School Day saw me and Pascal leaving early today. I played with my Sony HDR AS15 at Silicon Valley Lines last night and shot this video of #6574 passing through the layout town of Tracy. Tonight I planted trees on the hill top of Steinle. Turns out if I'd plant as many trees, as I was planning to put there, the tree group doesn't look right. Too much green in the center. Also the shape of several Supertrees was more flat than cylindrical, which looks a bit weird. Instead, I intentionally left gaps and arranged the trees in groups of three. This creates a more pleasing effect. This is the look I was after. A remote farm in the middle of the Black Forest. The trees on top of Steinle were planned to help creating a scenic divider between the town of Emsingen outside of the photo to the left and the "middle of the forest" area around Steinlehof. I also had this idea in the back of my mind that the trees would dwarf the building. That seems to work, too. The grass is quite a bit more like neon-green in this photo than in reality. The trees on Steinle as viewed from the Emsingen operator pit. I will find out if it was a good idea to do the trees first and then plant bushy ground cover afterwards. I haven't seen snakes on the trail for a while, and this one was by far the largest with over 3 feet in length. After finishing up the bridge, I finally attacked the top of Steinle, which has been pretty bare for years. The bare top of Steinle. 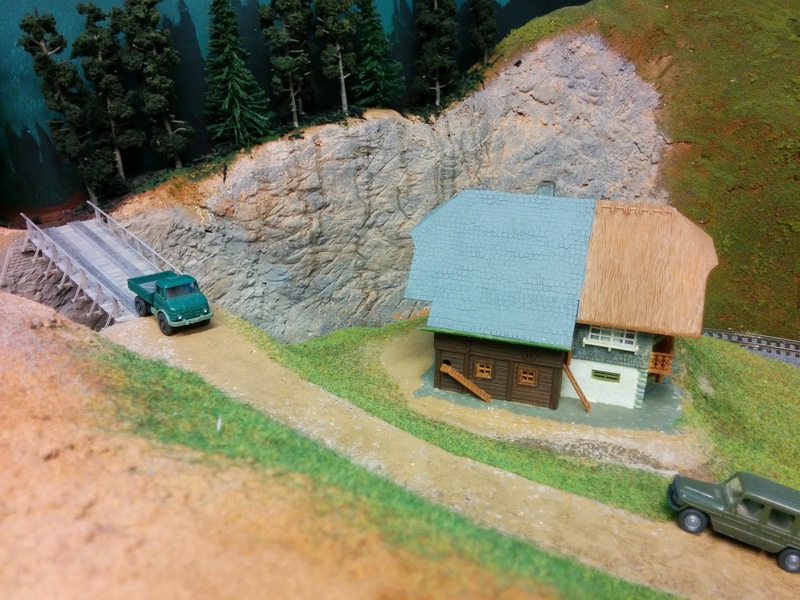 The weathering on Steinlehofbruecke is now done. I also brushed up the rockwall and added more vegetation. The plan is to cover the top with a fairly dense stand of trees. I applied real dirt, fine flock, and gras fibers to the area to allow for a more gradual transition from the surrounding gras to the bushes and trees. Dirt, flock, and grass applies to the top of Steinle. The glue is still wet, so the very dark areas will lighten up a bit over night. The cut leading to Steinlehofbruecke. I tried to go for a very non-orderly look by mixing various short and long gras fibers. A nice beer and food at Brotzeit Lokal, Oakland, CA. Wall Junction currently is a siding at the end of the line from Greenly on the Greenly Northern. Nevertheless, one can do switching moves out there. Due to regular passenger service and appropriate running speed, the whole exercise can take 15 minutes or more. Engine No. 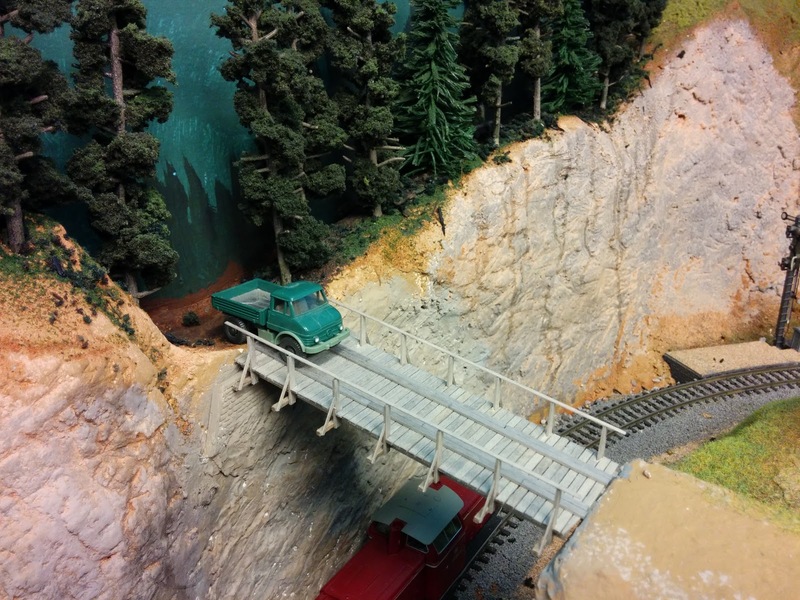 3 returns to Greenly with the cars it picked up at Wall Jct. Note the "bridge" in the back made from flextrack on top of Post-It note "pillars". Railroaders have a tendency to name everything. This is not only pretty and neat, but simplifies life dramatically. It's much easier to refer to a given siding or station by name, rather than saying "that siding on the east side at milepost 10.4". So far I have referred to the office layout as "the office layout". As of today, that is the "Greenly Northern" which runs from it's terminus at Greenly on my modified Timesaver module, to it's current endpoint at Wall Junction. 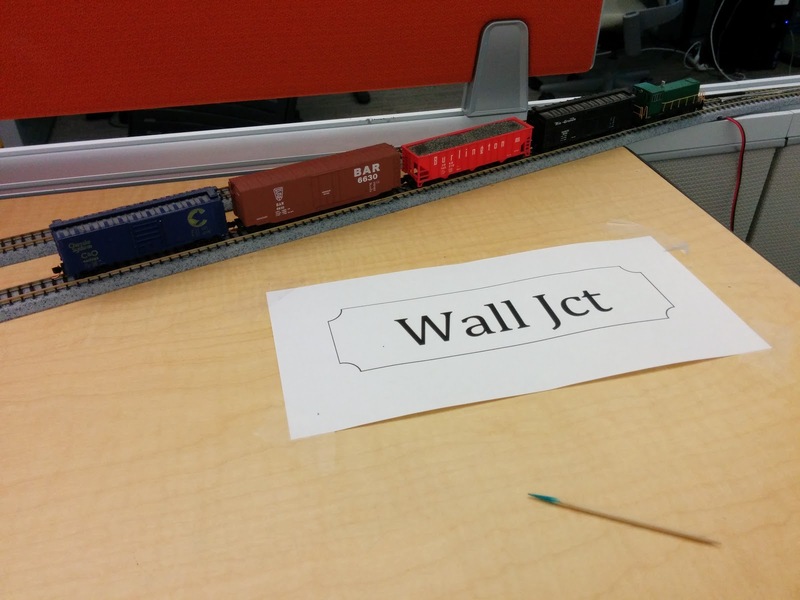 You guessed it, Wall Jct is where the tracks meet the cubicle wall. 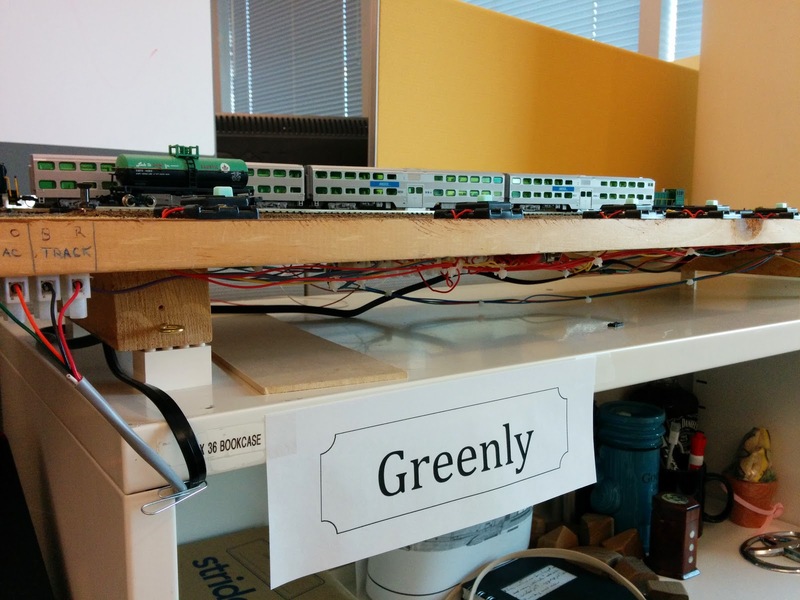 Why Greenly? The grass is green on the Timesaver. That's why. The Greenly Northern uses lots of second-hand and leased rolling stock. 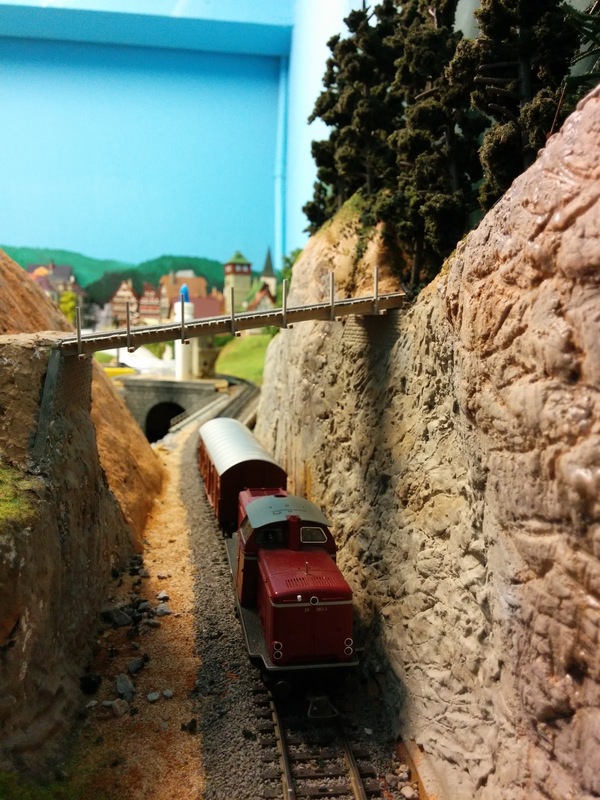 Thus, it's not unusual to see a wild mix of cars and locomotives with different road names. Tonight I had a some time to work a bit more on Steinlehofbruecke, and pretty much finished the bridge deck and railings. Back at the "workbench". I built up the second row of railings and stained the next round of strip wood pieces. Steinlehofbruecke is almost complete now. I added the outside railing supports, as well as the railing itself. Yes, the bridge is at quite an angle, and the railing posts are actually (almost) vertical. 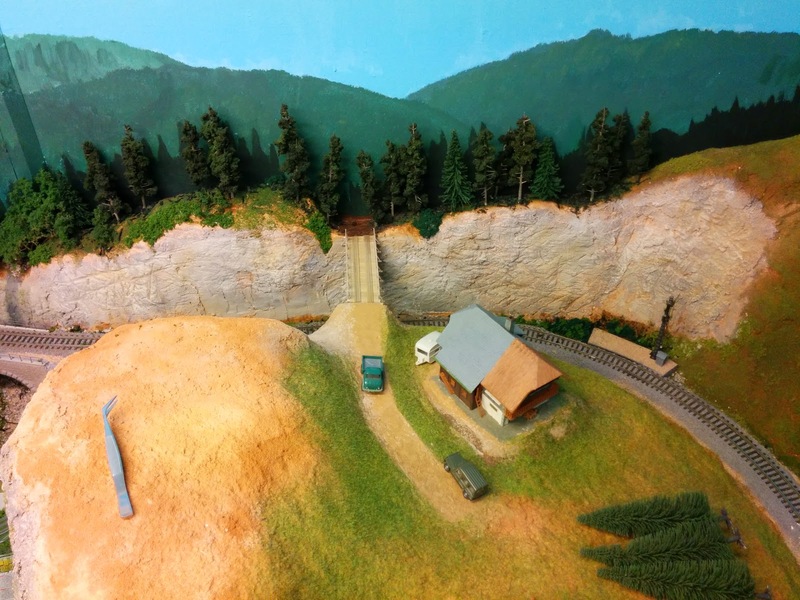 Time to fine-tune the scenery around Steinlehof and plant trees on top of Steinle. 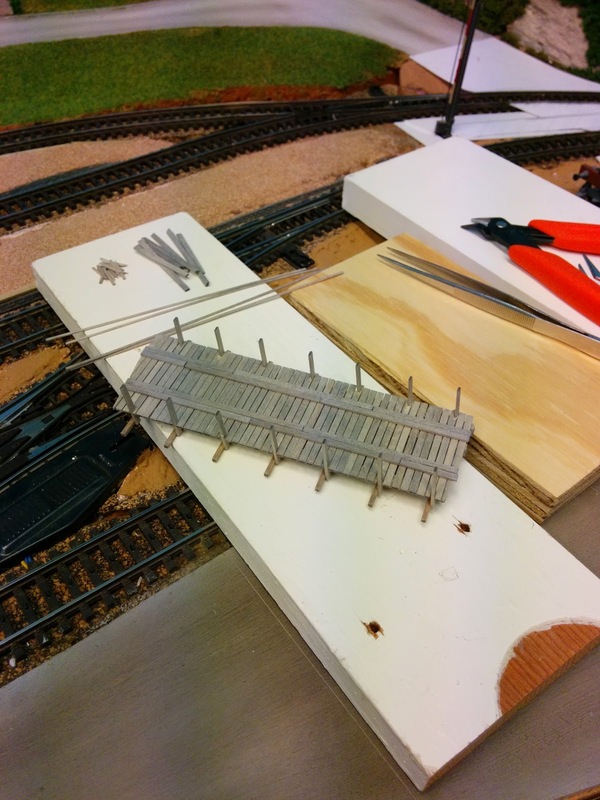 It's a bit hard to see in the photo, but I started to build the railings of Steinlehofbruecke.